Dachser has acquired around 65,000 sq m of real estate in the Breisgau industrial park in Eschbach, a town near Freiburg, Germany. In August 2018, the logistics provider will start construction on a new logistics centre, which will include a transit terminal with a total area of 6,117 sq m and 82 docking bays, plus a two-story office building. Completion of construction and the subsequent move are planned for mid-2019. The new logistics centre will replace the current branch in Freiburg-Hochdorf, which has served as the Dachser groupage hub for southwest Germany and Alsace, France since 1989. “As a logistics partner, we have grown with the local economy year by year, and now we have to add more capacity in anticipation of future growth,” explained Michael Gaudlitz, General Manager of Dachser’s Freiburg branch. Currently, the 150 employees at the Freiburg branch move 225,000 metric tons of goods each year. The new location southwest of Freiburg is situated directly on the A5 highway, with excellent connections to three countries: Germany, France, and Switzerland. This new facility will create ideal operating conditions and also offers opportunities for expansion in the future. Dachser is investing a total of about €22m in the construction project, and expects to create 30 new jobs. 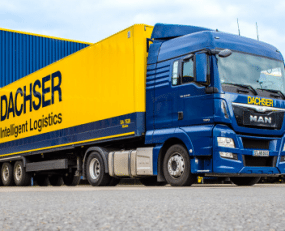 “Germany’s economy is going full steam ahead, and we see that reflected in the capacity utilization of our network,” says Alexander Tonn, Managing Director, European Logistics Germany at Dachser.